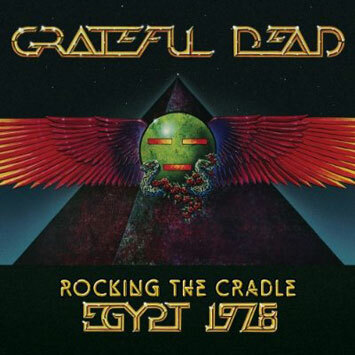 2xCD+DVD Collection "Rocking The Cradle: Egypt 1978" Celebrates The 30th Anniversary of the Band's Historic Concerts at Gizah With Previously Unreleased Audio and Video. Fans Who Pre-Order on Dead.net Will Receive an Exclusive Bonus Disc Containing Additional Egypt Performances. Available September 30 from Grateful Dead Productions and Rhino. In the fall of 1978, author and counterculture icon Ken Kesey reported to a close friend that he had recently witnessed "the latest Rocking of the Cradle of Civilization." The course of events that he went on to recall was the Grateful Dead's assorted family, friends and fellow Pranksters -- "Pyramidiots" of various origins -- descent upon Egypt's Nile Valley that culminated in three legendary concerts performed at the foot of the Great Pyramid in Gizah. Although perhaps unintentionally, the entire adventure might have been easily seen, as Kesey did, as one very special contribution to the then-critical Middle Eastern peace effort. To commemorate the 30-year anniversary of this cosmic convergence of sound and sphinx, Rhino and the band present the Grateful Dead's ROCKING THE CRADLE: EGYPT 1978, a 2-CD/1-DVD collection of highlights from this historic three-night stand. Recorded September 15-16, 1978 at the Gizah Sound and Light Theater, the original 24-track recordings have been remastered for this set in HDCD for superior sound quality. The two CDs contain 18 tracks featuring more than three hours of music, including a version of "Fire On The Mountain" that many fans consider one of the band's best. Except for three performances that appeared on 2004's Beyond Description boxed set, the tracks on ROCKING THE CRADLE have never been released. 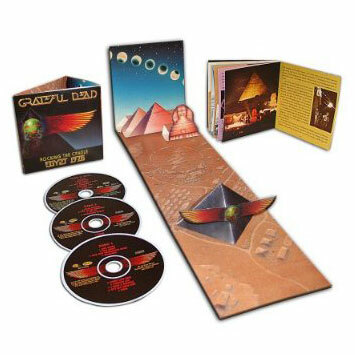 The accompanying DVD features more than 100 minutes of footage; including 13 songs from the third and final Dead Egypt show, which took place during a rare lunar eclipse. Legendary promoter Bill Graham called this show "one of the great experiences of my life." The DVD also includes a featurette titled "The Vacation Tapes" which catches never-before-seen candid band footage from the trip. The set comes in pyramid-inspired packaging and features rare photos from the trip and liner notes by longtime Dead associate Alan Trist, who was pivotal in making the trek to Egypt happen. Trist recalls that "the Dead long dreamed of playing at the foot of the Great Pyramid." However, pulling off this dream proved to be a monumental task as no other American band had ever performed there. The band spent months planning and making arrangements with the Egyptian Ministry of Culture. The band agreed to pay all of its own expenses for the trip and donated all of the proceeds from ticket sales to several Egyptian charities, as well as the Department of Antiquities, which preserves the country's ancient treasures. Another major challenge was the minimal amount of power available at Gizah, which required the band to bring in an enormous generator to power its state-of-the-art sound and recording equipment. In the end, the massive effort paid off. The Grateful Dead's Egypt shows were spectacular successes, attracting a mix of world cultures including American Dead Heads and European fans as well as curious Egyptians and Bedouins on camels drawn by the unusual spectacle. Unbeknownst to the band at the time, these shows would soon have a remarkable historical context. On September 17, the day after the last show, the Camp David Peace Accords were signed after nearly two weeks of secret negotiations. The Accords led to the Egyptian-Israeli Peace Treaty, which made Egypt the first Arab country to officially recognize Israel and ended a near 30-year state of war between the two countries. One has to wonder if the Dead's message of peace and love might have had some sort of impact on the negotiations. ROCKING THE CRADLE features Jerry Garcia (guitar, vocals), Donna Jean Godchaux (vocals), Keith Godchaux (keyboards), Mickey Hart (drums), Bill Kreutzmann (drums), Phil Lesh (electric bass, vocals), and Bob Weir (rhythm guitar, vocals). These performances took place just a few months before the band released Shakedown Street, its tenth studio album. The shows featured performances of several songs from the upcoming album, including the title track, "I Need A Miracle," "Fire On The Mountain," and an updated take on the blues standard, "Stagger Lee." The band also peppered its Egyptian setlists with classics like "Deal," "Truckin'" and "Stella Blue."